It’s that time of year when WrestlingDVDNetwork.com exclusively unveils the final content listing for WrestleMania on Home Video! 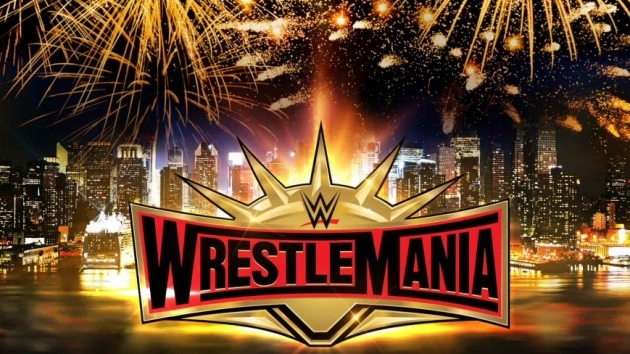 WrestleMania 35 will be produced as a 3-disc DVD and a 2-disc Blu-ray collection and it’s set for first release to fans in the United States on May 14th. Look out for a Ronda Rousey Topps trading card included inside the packaging of the domestic offering. ‘Mania will follow swiftly to Australia on May 22nd and to the UK on June 3rd (via Amazon.co.uk). What other goodies will be featured on this year’s WrestleMania DVD? 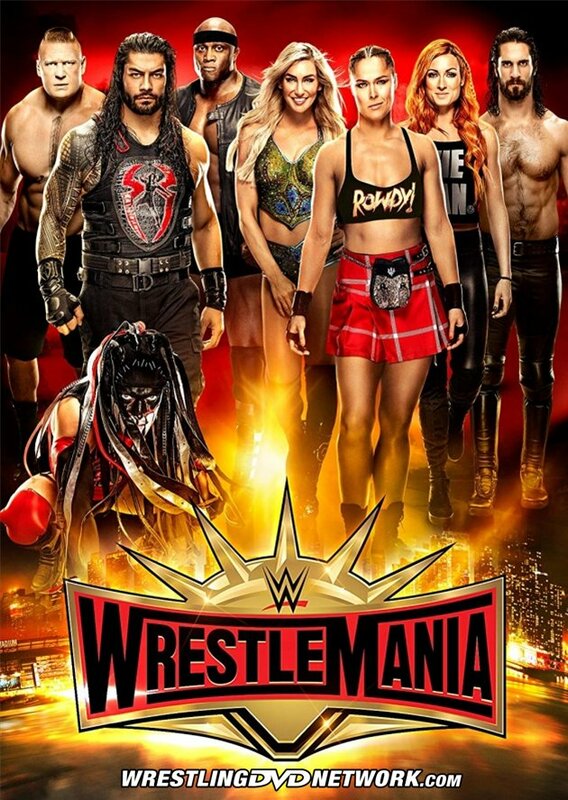 Along with the complete WrestleMania 35 Pay-Per-View will be all four Kickoff Show matches in its special features, and the full “RAW After ‘Mania” episode on top! There’s even more on the Blu-ray as this edition will include everything mentioned and Dean Ambrose’s farewell speech that followed RAW. – Where Has Mojo Rawley Been? Don’t forget, fans in the UK who pre-order online (that’s either the DVD or the Blu-ray version of WrestleMania 35) will receive an NXT TakeOver: New York DVD bonus disc! The NXT special from WrestleMania weekend will be sent out with orders placed at WWEDVD.co.uk. We now have it confirmed that as well as being offered online, the NXT bonus disc will be stocked in UK ASDA stores as a retail exclusive and will be bundled with the WM35 DVD across Germany. – USA: May 14th. Pre-order WrestleMania on DVD or Blu-ray very soon here on Amazon.com. – Australia: May 22nd. Your WrestleMania DVD pre-order is now live at Madman.com.au. – UK/Europe: June 3rd. Pre-order the WrestleMania DVD or Blu-ray now on Amazon.co.uk. Please go back to the original 3 disc sets I don’t like these packed discs it causes the to scratch not that none of mine are but I just like the original sets as is. Looks like I’ll have to download the HOF online then. I personally like all generations of wwe. Even vintage NWA stuff. I know that the style is different. But you got to realize wwe is changing as times change. WWE is what it is. Why did they stop releasing the fing hall of fames?! The only reason I purchase the wrestlemania’s anymore is for the hall of fames. I don’t buy them for the matches, I buy them for the hof ceremonies. They’re replacing them with the raw after mania, i’d rather see the hof’s. They didn’t release last year’s, they’re not releasing this year’s. It’s getting me upset, they don’t want to release all the hall of fames. I don’t enjoy watching wrestling anymore, it was more enjoyable when I was a kid, it’s not enjoyable for me anymore. So let me get this right. It was announced weeks ago that the Mania 35 release was going to be a 3-disc DVD/2-disc BD release and yet some people still held out hope that the Hall Of Fame ceremony would somehow magically still be included? Do people not comprehend the issue here that there was no way possible to include the HOF ceremony without adding an extra disc? It was the same deal last year. And before someone says “Well if they removed the Raw after Mania then they could’ve included the HOF.” Wrong. The Hall Of Fame ran nearly 4 hours. Raw, without commercials, runs about 2 hours and 5 minutes. Big difference. The biggest reason why they stopped including the HOF was because 2 years ago, for the Mania 33 release in the US, there was no room for the 3 pre-show matches to be included and a ton of wrestlers complained that they will be missing out on a big bonus check by being on the biggest selling home video of the year. And a lot of fans complained about it too. Exactly… see my comment below as I was honestly waiting for your two cents. The HOF and WM seem to get longer and longer, yet people can’t seem to do simple math. I would want the HOF to be paired with WM as well, but it isnt possible. I appreciate the reference to my comment about this on another post. It’s just some people refuse to understand the logistics of this. All they have to do is sell it on dvd seperately, not ‘DON’T DO IT AT ALL’. And you believe that would sell enough copies to make production of it worthwhile? Collectors and DVD fanatics are in the minority in 2019. Heck, they released the 2004 ceremony 15 years ago and it sold terribly even back then, despite DVDs being the latest thing; hence they had to start bundling the HoF with the most popular DVD release of the year. Rabidheat, you have to stop with all this use of logic. It’s frowned upon. So they can add an extra disc or get rid of the preshow matches. there’s other ways to release the f**ing hall of fame. Lots of people here who should be working in the WWE media department… I agree WWE should be releasing the HOF. However, such a hope completely ignores how they have been treating their media and events in general as of late, hyping them, not releasing them, and then telling people to go watch it on the Network. Crown Jewel anyone? WWE have been cutting back and are showing that they will not release things if sales statistics are falling. No more regular blu rays and even 3 disc sets seem to be slowly going out the door with hopes that people won’t notice. Sam, yeah sure, just cut the pre-show matches. And then explain to over 50 wrestlers why they won’t be getting their biggest residual check of the year. If you think you’re upset now, wait until a few years from now, when WWE completely cuts back on home video altogether. Plus, you just know as soon as they did that, Sam would be back on here complaining about the pre-show matches being left off, lol. They really can’t win. Daniel Bee any update on some DVD releases for May and June? I was hoping for Piper Unreleased or other Unreleased DVDs. Hs’s not going to spill news in the comments section. If there was any news on those things, an article would already be posted. Well I’m not falling for that B.S. about having to “pre-order” to get Takeover again this year. WWEDVD.co.uk are STILL selling copies of last year’s Mania with the so-called limited Takeover disc. The Raw after WM was really boring, I wish they’d include the HoF ceremony instead. Failing that, even the 40-45 USA Network version of the HoF would have been a nice bonus. I taped the entire edited version. But it’s not the same as having it entirely. If you recorded it off TV, why not record it off the Network? It’s the same thing. Of course now that they’re including the following Raw, it helps sales of the DVD in marketing terms as they can probably now slap Undertaker’s face on the back cover somewhere! Undertaker’s face merely being on the product shifts copies. I like the way WWE handled the departure of Ambrose. They handled it way better than CM Punk. With him, WWE seemed to be bitter. Punk quit with no notice. He didn’t show up to bookings and wouldn’t answer his phone, Ambrose showed respect, gave them noticed and did what was asked of him till the end. Big difference. Absolutely. It was Punk who was the bitter one in the situation. The only I could’ve seen the Hall of Fame getting included is if this was a 4-5 disc DVD/ 3 disc Blu-ray. If I’m not mistaken, I think the Hall of Fame was about 4 hours if not around 4 hours. I lost track of time because I had lost signal during the ceremony at one point so I’m not sure how long the ceremony was. If it was 4 hours, that takes up 2 discs on DVD and needless to say, a single blu-ray can hold 4 hours of footage. According to the Network the HOF is 3hrs 35 minutes, so its still quite long and no way it would fit on a standard 2 Disc Blu-ray and 3 Disc DVD along with the nearly 7 hour WM including kickoff matches and extras unless they add an extra disc. Given how WWE are even cutting back standard 3 disc sets to 2 disc now, there is no way they will add another disc to WM. To be fair, they probably edit 35 minutes of waffle out of the Hall of Fame ceremony and get it down to 3 hours, which would fit on a single DVD disc. Can we please have an ‘Edit Comment’ function on this site btw, like on Disqus sites? Been asking for years, lol. So you mean to tell me that since they decided to not record ‘THE HALL OF FAME’ on d.v.d and blu-ray d.v.d, the only way i’ll have this event is to record the HEAVILY EDITED version on the ‘U.S.A.’ channel? Seriously? What a gip ! So you didn’t notice the exact same thing happen last year then? Of course i knew. Didn’t think they would do it twice in a year. If they’re gonna stop recording the hall of fame on home video formats, they should just stop having the event. Yes, let’s stop having an event that makes a ton of money in ticket sales, is one of the most anticipated events of Mania weekend, not just by the fans, but bu the wrestlers as well. All because they no longer release it on video. How about buying a DVD recorder and just record the Hall Of Fame off the Network, the same way you record it off TV? But surely if they took that new approach last year, did you not think that was clearly going to be the new standard going forward? Seemed pretty obvious to me! well, in theory you could download the Network stream (not that I would condone such a thing). Not sure why people are shocked there is no HOF in this set. Wrestlemania alone was 7.5 hours with the preshow, which looks to be edited. Because of this, it’s impossible for the HOF to be included. This was assumed an article or two ago by LP1 who intelligently pointed out the difficulty of inclusion. It simply can’t fit on two blu ray discs. So am I to understand that for the second year in a row, the WWE will not be including the HOF induction ceremony in its entirety, either as part of this DVD or Blu-Ray set or available separately? Why is this even happening as it’s still something worth watching, despite the increased length of the event. Not cool at all! Hoping they rectify this ASAP!! What on EARTH makes you think they will change the content listing at this point? Because you have commented here that you want the Hall of Fame? And if you knew that they changed course last year and stopped including it in favour of the Raw After ‘Mania, why are you at all shocked that the trend has continued this year? You thought that they would only do it that way last year for a one-off and then revert right back? Well, I certainly hope they will make it possible to release the event separately as they did one time ago, since they’re unable to fit the event on either the DVD or Blu-Ray formats. It’s the least they can do for their loyal fanbase who still enjoy such a ceremony. Everybody repeatedly said this last year and it didn’t happen, so I’m not sure why anyone would expect it to now. Just trying to manage your expectations here! What??? Again no Hall of Fame Ceremony in the pack?! We want Hall of Fame Ceremony, not the crap Raw after maina. What the hell, no Hall of fame again? Nope, and they’ll probably won’t record next year’s on either format.